Now, you may think that because I’m a self-employed freelance writer, I stumble into bed at 3 AM, yawn and stretch my sleepy limbs at noon, and then talk to my plants for an hour while eating a sumptuous breakfast involving at least three bacon courses. That’s what I would do if I were smart. Instead, I have my love to keep me warm…and groggy. The Boy works a bizarre schedule which has him up at 4:30 or 5:00 in the morning for about half of every week, and like the devoted sucker I am, I get up with him. But breakfast? BREAKFAST? That, I simply cannot do. He’s lucky if I manage to make it past the couch, where I typically wrap myself in a blanket and rock gently until I’m no longer praying for death. Hey, I said I was devoted, not superhuman. But still, The Boy’s gotta eat. And–despite the fact that food is, oh, THE LAST THING ON MY MIND while I’m doing my level best to maintain sanity and comprehend the fact that the sun is not up and yet I am I SAID THE SUN IS NOT UP AND THERE IS NO REASON ON EARTH WE SHOULD BE EITHER NO I DO NOT WANT YOU TO GET FIRED I JUST WANT EVERYONE TO SEE REASON AND REALIZE THAT THERE IS NO EXCUSE FOR ANYTHING TO BE HAPPENING BEFORE 10AM–I should eat, too. Nothing fancy. Nothing that even requires electricity. Just something The Boy can grab on his way to the bus stop. Something that I can figure out how to unwrap, masticate, and swallow until everything makes sense again. 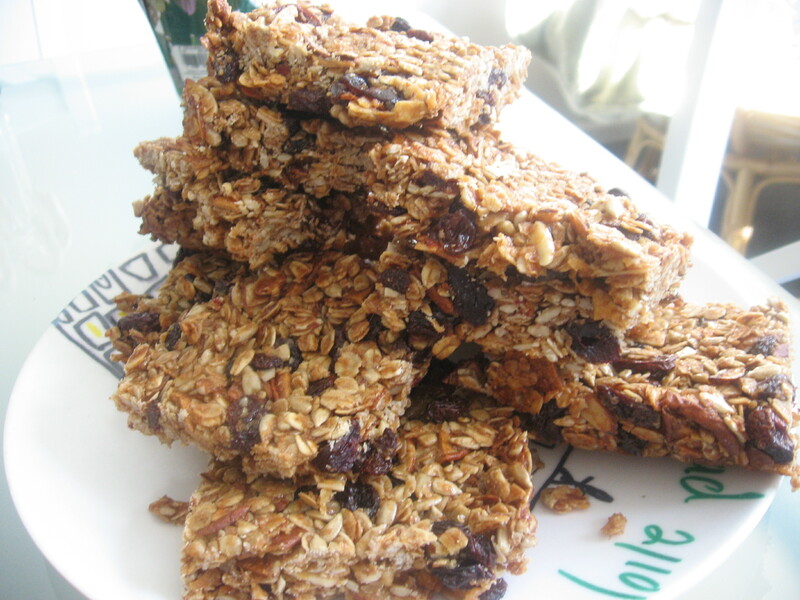 Enter, the granola bar. I used this recipe for inspiration–it’s based on the Barefoot Contessa’s recipe. Then I changed a bunch of stuff. A lot of stuff. Still, though, credit where it’s due. It’s a great foundation recipe, just perfect for switching your favorite fruits, nuts, and favorite delicious bits in and out. It’s vegetarian and can even be made vegan by changing the kind of fat you use. And friends, does it ever smell (and look) good when you pull it out of the oven. 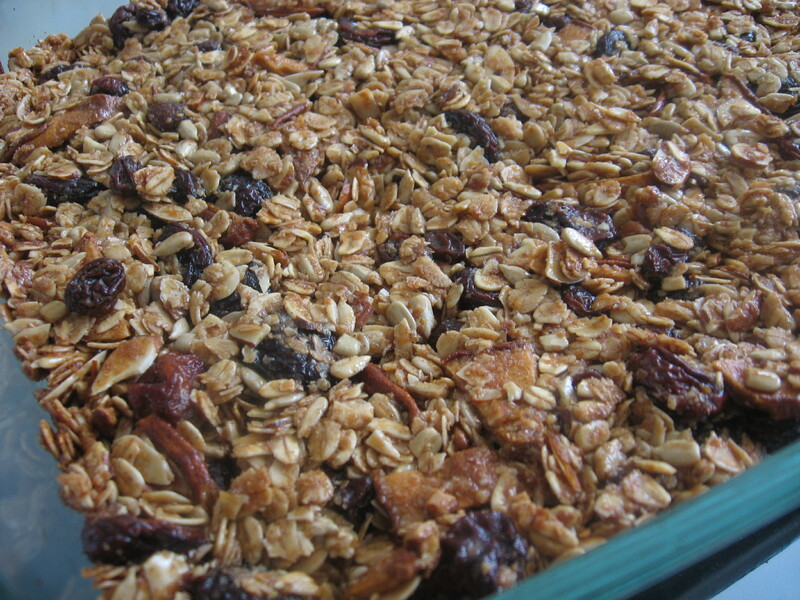 My last version was as I’ve listed it below–full of plump dried cherries, toasted almonds, and oat-y goodness. I’ll be making another batch tonight, this time subbing in some peanut butter and chocolate chunks (oh, just a few…BACK OFF, I SAID JUST A FEW AND IF I CAN’T HAVE SLEEP I WILL HAVE MY CHOCOLATE). Oh, yes. I will have my chocolate. Besides. It makes me feel good to know that somewhere, out there in the darkness, The Boy is riding some cold, bumpy bus to work, just as tired as I am, but perhaps with the hint of a smile on his face as he chows down on a breakfast in his number one favorite flavor combination, made by the BMG who loves him. A BMG who is still at that moment incoherent and slightly out of her mind, yes. But still–a BMG who loves him. Preheat the oven to 350˚F. Butter a glass 9 x 13. 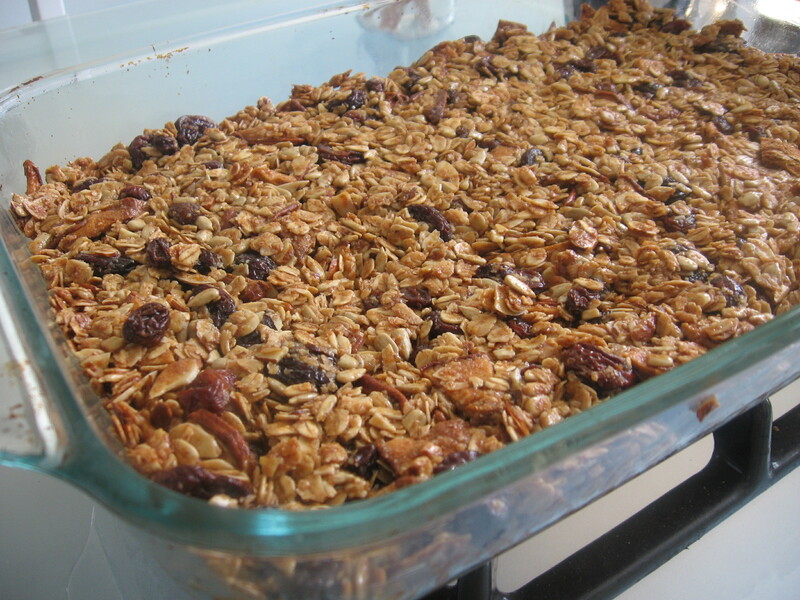 Toss the oatmeal, almonds, and sunflower seeds together on a sheet pan and bake for 10 to 12 minutes, stirring occasionally, until lightly browned–I actually usually need 12 to 15 minutes. Transfer the mixture to a large mixing bowl and stir in the wheat germ and fruit. Place the butter, maple syrup, brown sugar, vanilla, and salt in a small saucepan and bring to a boil over medium heat. 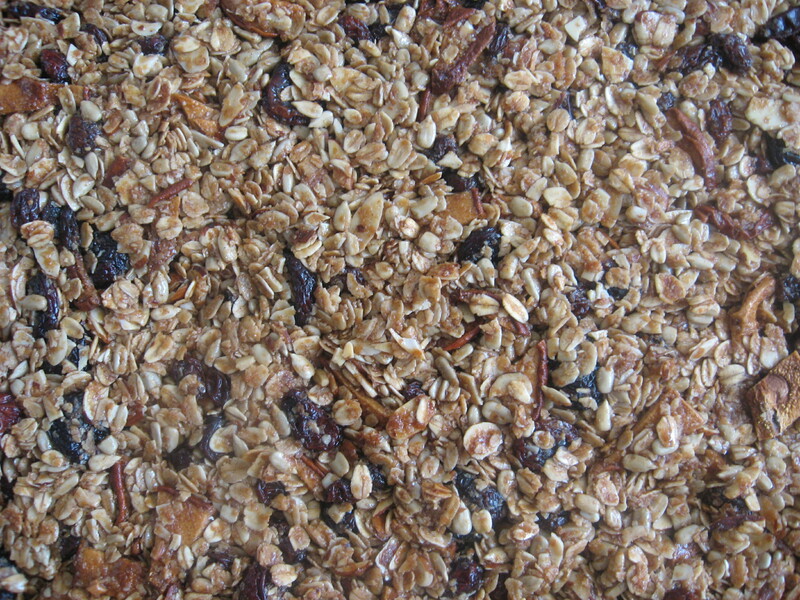 Cook and stir for a minute, then pour over the toasted oatmeal mixture and stir well. 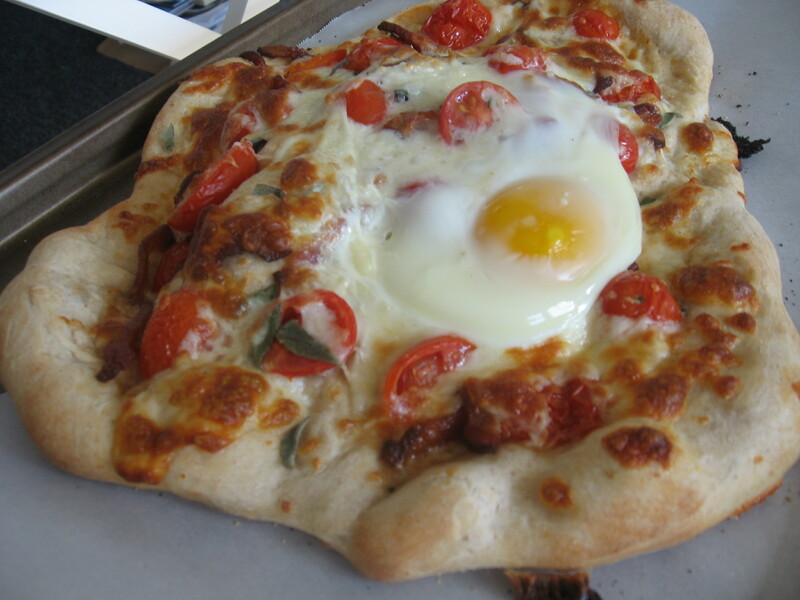 Breakfast Pizzas, OR, Pepperoni Cigarettes, Now THERE’s an Idea! You know how you start the weekend off with a bang? No, not that cold, congealed stuff–though that has a special place in my drunken little heart, too. “Pizza for breakfast? Way radical!” with a picture of a spiky-haired kid skateboarding past, grabbing the pizza out of his mom’s hands while she wears a half-shocked, half-bemused expression. Didn’t McDonald’s do something like that? Like, when they tried to market something that looked like a quadruple-pounder with cheese and three buns as a great way to start the morning? But let’s get real. The point of this post isn’t how to create a pizza advertisement. It’s how to make a damn fine pizza. Last weekend I wanted to surprise The Boy with something special on Saturday morning. You know. Aside from the usual something special. I never said I could keep a secret. I usually use Chris Bianco’s recipe for pizza crust, which is excellent, to be sure. But seeing as how I have a sourdough starter just lounging around, I used that instead. WHICH WAS THE GREATEST IDEA EVER. I didn’t measure. Didn’t weigh. Didn’t consult any recipes. Just went with my gut. And my gut told me to feed and proof the sourdough starter on the counter for 8 hours, then toss in enough flour, wheat germ, and salt to make a nice, soft dough. Then my gut instructed me to knead the dough until it was firm and elastic-y, let it rise, punch it down, and let it rise again for another half hour. Bingo–sourdough pizza dough. And as we all know, sourdough bread makes THE BEST toast, and therefore is perfectly suited to tangy, crunchy-on-the-outside, soft-on-the-inside, makes you go “Mmmm” pizza. My gut is so smart. And strangely specific. Anyhow, I did all this during the afternoon on Friday. Then I just stuck the dough in the refrigerator and prepped all the toppings so that the next morning would be effortless. I don’t think I have to tell you how flexible pizza is, so just use whatever’s on hand, whatever appeals to you. But in my case, I halved cherry tomatoes, snipped up a bunch of fresh sage, cooked and crumbled a few slices of applewood bacon, shredded some aged mozzarella, and painted my nails. Oh, the nail thing was for me. Not the pizza. But I highly recommend it. The next morning as I stumbled out of bed and zombied my way to the bathroom, I made a quick detour to put the oven on full blast at 500F degrees and take the dough out to rest on the counter. About 45 minutes later, I dusted my pizza peel with cornmeal, stretched out my dough, and began piling it all on. Mmm, piling it all on. Ooh, this would be a good place to mention that I topped the pie with a raw egg carefully cracked on top. I LOVE doing this. 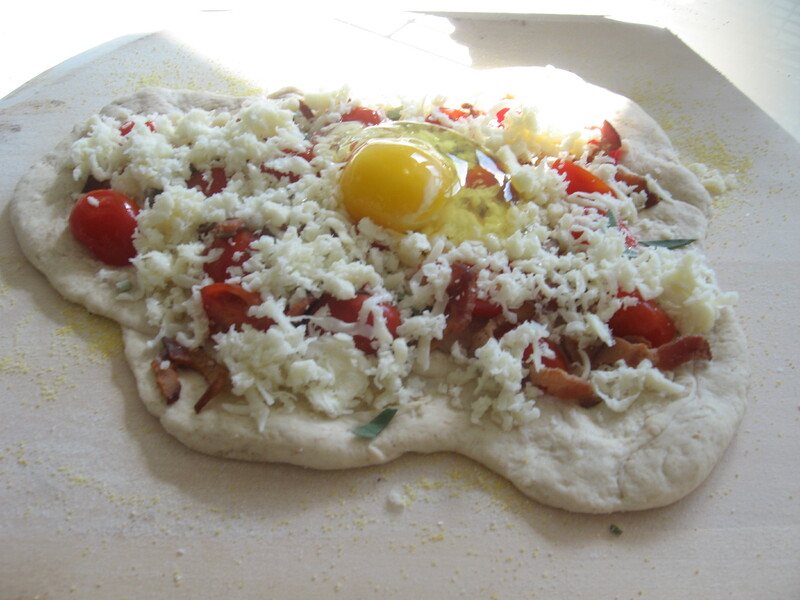 When the pizza comes out the oven, the egg will be fully cooked with a still-runny yolk, so you can break it and spread it out all over the pizza. Don’t give me that look, you know you want it. Pizza. For Breakfast. For Dinner.